Personalized forest & khaki 44” arc barrister auto – open folding umbrellas are inspirational umbrellas, which spell green and talk green. This umbrella is loved by everyone due to its inspiring color tone and it is often ordered for gifting by marketers with green business interests. 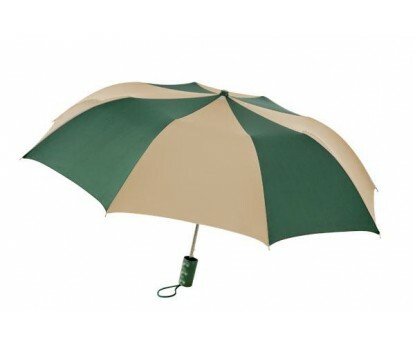 This umbrella possesses automatic open function, metal shaft, and plastic handle with carrying strap. Marketers can utilize the imprint space - 9 ¼ “W X 6 ¼” H X 6” top – over 44” arc forest and khaki canopy to express their business messages. Dimensions- 44", folds to 15".